I have a ton of recipes pinned to try on Pinterest. It had been awhile since I had tried a new one, so I plucked this up and tried it. This lovely salad comes from Zizi’s Adventures. She has a beautiful blog full of yummy recipes like this one. It looked so good I had to try it. It tasted AMAZING! We actually made it twice since the first batch disappeared quickly. I tripled the recipe and changed a few things the second time around. This recipe has all my favorite ingredients. In my world, avocados make everything better. The original recipe called to cook the greens and garlic, but I like them raw better so that is how I did mine. Cook the rice and let cool. I actually did this the day before. Same with the beans if using dried beans. 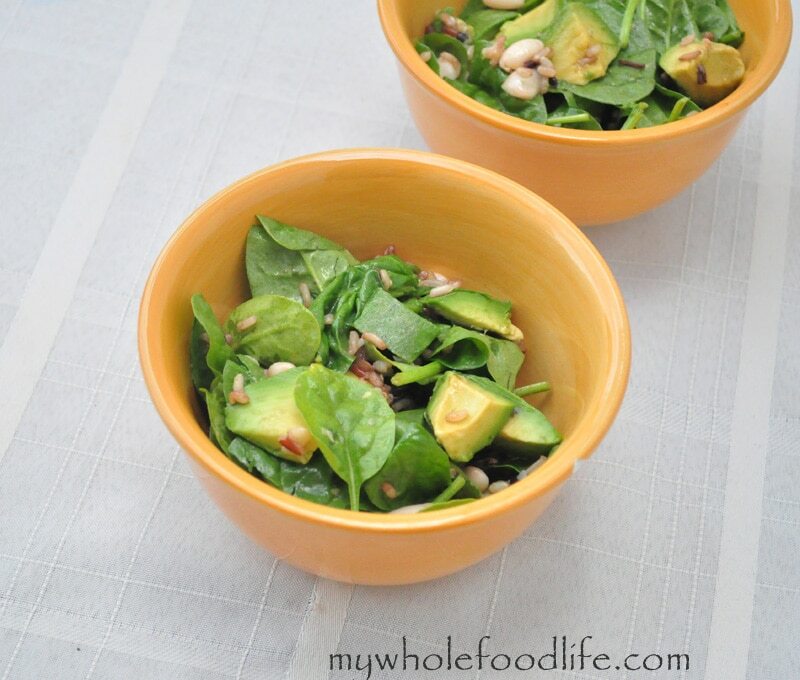 In a large bowl, add rice, beans, avocado, garlic and spinach and mix well. In a small bowl, whisk the ingredients for the dressing. Pour dressing in the large bowl and mix well until everything is combined. I found the best way to do this was with my hands. This dish is best eaten fresh, but will still be delicious the next day. I makes about 5-6 servings. Enjoy! Yummy! Avocados DO make everything better! I can't get enough of avocados at the moment! I made this last week with a pre made salad from Trader Joe's (has spinach, chard and kale SOOOOO GOOD), left out beans and it was SMASHING!!!! Last night I only had kale, still no beans and added semi steamed broccoli... Omg! I've died and gone to heaven with this salad of yours!!!! The combinations are endless and adjusting it to suit tastes is soooooo easy! Thank you so much! That's great! I have got to try it with kale! This was fantastic! I used Kale and brown rice so, so, so good! Glad you liked it! We make this often. Yum, Yum, Yum! Made this for dinner last night and it was delish! Didn't have time for the wild rice to cook so the first helping I added shredded carrots. Second helping I heated up TJ's frozen quinoa w/ zucchini & sweet potato. Both versions were amazing. Love this! This was an awesome salad! Both my husband and I loved it. Going on the favorites list. Thank you!! We make this often as well.